What makes an article stand out? 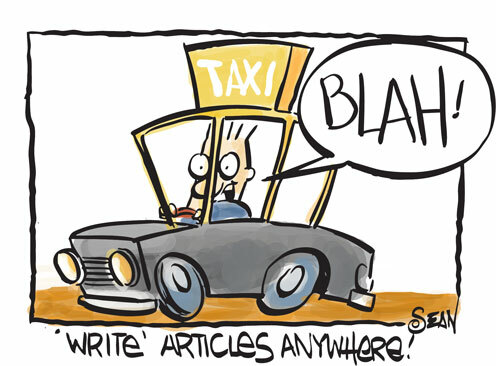 Articles can be mundane or enthralling. But what makes an article stand out? The short answer is enthusiasm. Yet, it's not easy to know how to create enthusiasm in an article, is it? Let's step through the three phases that makes your article pack a rollicking amount of enthusiasm. Part 2: Why you need to feel very strongly about the issue RIGHT NOW. Part 3: Why you need to be able to deviate from your script a bit and make it messy. What is the definition of sales? There's are probably a lot of definitions, but back in the year 2003 or so, Canadian-born American motivational public speaker and author, Brian Tracy came to New Zealand. I loved Brian's work and got to know him personally. One of the things I really liked was his definition of sales. “Sales is a transfer of enthusiasm from one person to another”. Something you were forced to do to get your product or service in front of a client. With this definition, Brian changed the way I looked at sales. What he couldn't have known is that he didn't just change my perception of sales, but of communication itself. If selling could be enhanced through enthusiasm, then so could writing. Instead of just putting words on paper, an article could come alive with enthusiasm. There's just one problem, isn't there? How do you write enthusiastically? Are there stages or steps to follow? Not surprisingly, the stages aren't something you're unfamiliar with. The steps to enthusiastic writing are seemingly so obvious that it's easy to miss them. Writing can get really grimy without the power of enthusiasm. It's time to find out what makes your words sing, isn't it? Let's take a look at the three steps you're going to need to put that zing in your words. 1: You need an outline. And the outline needs to be fresh. 2: You need to feel very strongly about the issue RIGHT NOW. 3: You need to be able to deviate from your script a bit and make it messy. The week my mother in law came to stay with us, I had to throw out all my spices. Most people think that cooking is the act of getting ingredients together in a pot or vessel. But we also know that ingredients matter. The fresher the ingredients, the tastier the food. What we seem to forget are the spices. Like many others, I bought bottles of spices and they sat in the pantry for weeks, even months on end. My mother in law was appalled at the lack of freshness. She got me to bin the entire lot and start with a fresh lot. Whether you're outlining a big project, like a book, or a relatively smaller project, like an article, you're still dealing with the factor of freshness. If the outline is a week old, it's already getting relatively stale. If it's older, you're likely to be struggling to find out what you outlined in the first instance. I'm not exactly the kind of person that loves to outline. The reason why I do so is because I know it gives me structure and it saves me an enormous amount of time. Even so, there's the curse called “excessive outlining”. In my desire to create a truckload of content, I'll head to the cafe and outline five or ten articles. If I get down to writing those articles within a week or two, maybe even three, I'd be fine. But as you can tell, it's practically impossible to write so many articles in such a short time span. I get newer ideas along the way, and add to the mountain of outlines and the longer I wait, the more the earlier outlines seem to fade into oblivion. I will look at the outlines; I know they're important, but they're not fresh anymore. Like those spices in my kitchen cabinet, I can throw them in the dish, but they won't enhance the dish at all. Which is why you need to get an idea, outline it, and then get started with your writing. If you need to re-outline the material along the way, that's perfectly fine, but the outline must be relatively fresh at all times. The longer you wait, the more you have to battle with what you were really thinking about. And battle takes up a lot of energy, which means that you're less likely to write with any sort of enthusiasm. An outline for an article will tend to have a pretty straightforward construction. That article outline isn't going to change a lot six months or even six years from now, is it? You can still write a great article or create a chapter in a book about it. It makes no sense to say that six years from now you will shy away from writing the article. But this is where the weirdness kicks in. Intellectually you know you can write the article, but when it comes down to writing it, the fact that you wrote the outline a while ago will prevent you from getting too far ahead. You'll somehow want to write another article—any article—and avoid the one that's stale. Fresh outlines are like fresh spices. You shouldn't wait too long. You need to outline and write as quickly as possible. But why not write on the day itself? You could, of course, but more often than not it's better to keep a bit of space between the outline and the material you're about to write. Why? Because the outline allows your brain to let the thoughts percolate. A day later your article is likely to be far superior because you've been thinking about the contents as the hours tick by. An outline, a fresh outline, is crucial to get that enthusiasm in your writing, but it's not enough. The second most important factor is feeling strongly about the issue right now. My friend Cher taught me an important lesson on the day of my father in law's funeral. When someone close to you dies, most people are uncomfortable around you. They know you're grieving and they feel your pain. It's at this point that almost everyone makes the same statement. They say something like: “If you need anything, please let me know”. Cher did something entirely different. She baked a whole bunch of muffins, brought them over, stayed for a short while and then left. I feel that so many people tend to use words, not actions. That if we were all like Cher, we wouldn't be asking “what can we do?” Instead, we'd be doing something for our friends, our relatives or even that stranger that we may never meet again. 1) Not ask what we should do, but do something instead. 2) Not wait to tell someone how they changed our lives, but be specific about how they did it. We may have just run into a problem and the issue is top of mind. Or we may have been the recipient of a great wave of generosity. But you don't always need to be prodded by happy and sad moments. You could have just heard a podcast and that could have ignited a fire within you. Or in the case of this article, a client may ask you a question that you feel needs to be answered in detail. There are lots of things that rev up the engines of your brain and the more strongly you feel about these issues right now, the more likely you are to write with a greater amount of enthusiasm. Yet, doesn't this “feeling” lead directly to the outlining process? Yes it does. The feeling comes right before the outline. Once you feel the surge, you then get down to outline. However, in many cases, a surge may break the rule of outlining. Take for instance, when you see something on Facebook or in a forum. There's a discussion going and you need to get an important point across. In such a scenario, outlining may slow down the process and the moment of passion passes. Instead you need to capture the enthusiasm while it's still fresh. What you tend to write in that moment may be remarkably more lucid than anything that's outlined and planned. Outlining is smart because it saves time. Writing an answer quickly is just a way of getting your thoughts out quickly and keeping that fire alive. It's a shoddy excuse if you just want to avoid outlining. Yet it does feed the flames of your outline. I tend to write quickly, if needed, but then I will create an outline and fit the information into that outline. Later, probably the day after, I will write the article or the chapter in the book. Yet it does strike from time to time and if you don't go through the process of writing down your thoughts and fashioning them, your writing won't necessarily be dull. A lot of writing is done by sitting down and just working your way through a project. Yet, that sparkle that comes from frustration, desperation or inspiration comes and goes in quick bursts. Learning to capture those shiny bits in your article is what a great writer does. All of this outlining and striking when the iron is hot is about structure. It's about discipline. Yet, enthusiasm often shows up when you least expect it. It's at this point that we need to learn to trust the diversion. Let's find out how deviating from the script is a good idea to create a high level of enthusiasm. When does a concept become a coconut? When you run into your computer's auto-correct, that's when. Like the other day when I was writing an answer in the forum in 5000bc. I fully intended to use the word “concept”, but as you do, my fingers went on their own journey. And as I typed something that was clearly garbled, the auto-correct suggested “coconut” as a replacement. This is the messiness, the unexpected factor that leads to enthusiasm. It's not unlike the “I have a dream” speech by Martin Luther King Jr. In the book, “Messy”, author, Tim Harford talks about how Martin Luther King Jr valued preparation. By the age of five he was learning Bible passages by heart. By fourteen his dedication to detailed research, outlining and re-outlining was paying off as he won a prize in a public speaking contest. This attention to sticking to a script paid off time and time again when he started preaching, then later as he snapped up an oratory prize in college, and finally helped him get his job as a minister. Every sermon started out on yellow lined paper as an idea on Tuesday, would be researched and re-drafted many times during the week, before he delivered it on Sunday. He lavished well over 15 hours a week learning every sermon by heart, just so that he never had to refer to his notes. It was an improvisation. Even though he went through his prepared text for most of the speech, as he came to the end, he started to improvise. At that moment, Mahalia Jackson shouted: “Tell them about the dream, Martin!” And then he was off, giving one of the most memorable speeches, that seemed to take a life of its own. Often writers are astounded to find that the character in the script dictating the series of events. Just like “autocorrect” on your computer, the character decides what to do next. This concept of the character taking over sounds really odd, until you speak to writers who express how the words on the page seem to come alive in a way that is hard to imagine. The outline is crucial, there's not a shred of doubt about that fact. The outline lets you stay within the parameters, but an outline can also be the launching pad for enthusiasm of a monumental scale. Suddenly the words are flowing out of you in a way you can't imagine. The result is something you're not anticipating, and yet it's extremely pleasing when you get to the finish point. Make no mistake: the results are random when you're first starting out. Martin Luther King Jr. was no average speaker. Writers, singers, jazz players, sports people—they're not rank amateurs. They've got a bit of practice under their belt and it's only at that point that the improvisation kicks in. No one is a great writer. Everyone is still learning their craft and the best way to get started down this path of improvisation is to simply go down the road when you hear “improv” calling you. The enthusiasm you feel for the subject matter will present itself in a way that you don't or can't expect. Even in the very early stages, you should break free and let the text take over. Unburdened by typos and grammatical errors. Unfettered by whether what you're writing makes sense or not. Writing in a way that a cartoonist doodles, without a care in the world. Take for instance the script of the podcast. When I first started doing the podcast back in late 2014, I'd have a very rough outline, but no script. I'd stick to the points but all of the thoughts had to be improvised as I went along. By mid-2015, I not only outlined the podcast in great detail, but started reading it off the computer screen and then off a teleprompter on my iPhone called Promptsmart. I thought I was doing a great job until someone suggested I could do better. That comment via e-mail got me thinking about what I'd learned about the diversion; about how letting go was a smart strategy. And so that's what I did. I still have the outline. I still script and follow the script, but from time to time in the podcast, I'll let the diversion take over. This diversion perks me up when I'm bumping down the side road, but also gives a ton of energy when I get back on track with the script. It's odd, this advice—even contrary. And yet we know it to be true. To get enthusiasm you have to doodle, do some fair work, then go back to doodling again. It's what makes for great work, and brings immense power to your words. 2) How do you stop knocking on client’s doors, and get them to call you instead?